Columnist Jon Talton explains why we can't use tariffs like these to rebuild America's industrial base. World trade is much more complicated than it was a few decades ago, and the new tariffs could cost many more jobs than they regain. Does imported steel hurt our jobs? 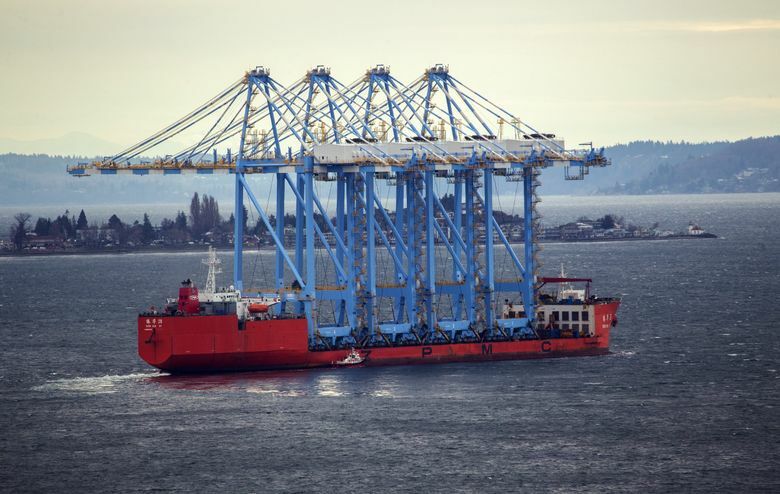 The giant Super-post-Panamax cranes that recently arrived at the Port of Tacoma were made from steel in China, with advanced components from a worldwide supply chain, and shipped here on a Hong Kong-flagged vessel. These types of cranes aren’t made in the United States now. On the other hand, expanding the container capacity of the Northwest Seaport Alliance is essential to keeping the Seattle-Tacoma venture competitive, helping it regain market share among West Coast ports and supporting an essential asset for trade-dependent Washington. The maritime, seaports and logistics sectors in the region support thousands of well-paying jobs, including blue-collar jobs. Continued upgrades to the ports also support construction and maintenance jobs. (And incidentally, Nucor has a steel operation in Seattle). This shows the complexity of world trade today, as opposed to, say, 1965. And it illustrates in part why President Trump’s tariffs on foreign steel and aluminum could cost many more jobs than they regain. And if nations retaliate, as is likely given the blanket nature of the duties, the result could be a ruinous trade war. By the way, China isn’t America’s biggest supplier of imported steel — Canada is, followed by Brazil and South Korea. Read more from economics columnist Jon Talton here. It wasn’t always this way. America vaulted to become the world’s largest steelmaker around the turn of the 20th century (when we were a developing nation on the rise). With the terrible damage globally in World War II, America enjoyed not only an intact industrial base but a rising consumer economy. And hundreds of thousands worked in mills and associated industries. The situation changed for many reasons. Europe and Asia rebuilt and began exporting to the richest market, America — often enjoying cheaper labor and newer technologies. Like their counterparts in Detroit, Big Steel executives were complacent and failed to make new investments to stay competitive. When this changed, automation became one of the biggest enemies of the steelworker — but not the only one. The mergers and leveraged buyouts of the 1980s ravaged the American steel industry. Iron ore played out in northern Minnesota (taconite was substituted), but the old chain of trains to lakers like the Edmund Fitzgerald was disrupted and left at a cost disadvantage. American industries and unions lacked the cohesion and government support of Germany. Nothing stands still, but it’s interesting that much of the damage to the U.S. steel sector was done by Wall Street’s demands and oligarch vulture capitalists that enjoy Trump’s favor and admiration. On the other hand, America developed new industries, many of them advanced. And steel reinvented itself, with Nucor’s minimills at the forefront. (If you can get a copy of American Steel by Richard Preston, he makes this a heroic, compelling read.) U.S. Steel is still around, as are a number of new or combined integrated steelmakers. Assume that their exports will be targeted for retaliatory tariffs. I don’t know how you put the toothpaste back in the tube. Even a Fortress America, where we only did business with ourselves (goodbye to essential world customers for the likes of Boeing), would take years, decades to recreate. In the meantime, we would be inflicting terrible economic pain on ourselves, with the working class getting hardest hit. A better response would be developing new breakthroughs that can employ Americans at good wages. Or regaining our high-tech advanced manufacturing base. But moves such as these antagonize Trump’s wealthy backers. These tariffs are done under shaky “national security” authority (rather like China, whose practices we supposedly dislike). They risk undermining more than 70 years of trade liberalization led by America. This has had a geopolitical benefit of seeing allies such as Japan, South Korea and Western Europe become highly advanced economies. And helping to manage China’s peaceful rise. Now, once again, we’re stepping off into thin air. America First — to take this irresponsible move.